The Lion (Panthera leo) is the second largest cat in the world, after the tiger. The lion and tiger are closely related and they share a very similar body type. As its scientific name suggests, Lion is one of the five members of the Panthera genus.Notes 1 Here are 20 amazing lion facts. Despite dubbed as the “king of the jungle”, lions very rarely enter a closed forest, and they are totally absent in rainforest. They prefer grassy plains and savannahs, open woodlands with bushes and scrub bordering rivers. Asiatic lion (Panthera leo leo) only lives in Gujarat, India. There are around 650 wild individuals. An apex predator is a predator residing at the top of a food chain upon which no other creatures prey. And if keystone predator is removed from the ecosystem, the populations of the species which it preys upon explode uncontrollably, driving out most other species. Ecosystems that lose their apex predators and/or keystone species often witness detrimental impacts within all trophic levels and consequently become dysfunctional. On Mount Elgon, an extinct shield volcano on the border of Uganda and Kenya, Lions have been recorded up to an elevation of 3,600 m (11,800 ft) and close to the snow line on Mount Kenya (which is around 4600-4700 meters or more than 15,000 feet). With an elevation of 5,199 meters (17,057 feet), Mount Kenya is the highest mountain in Kenya and the second-highest in Africa, after Kilimanjaro. Most felids remain quite solitary the in nature. But the lion is the exception. They are very social animals and usually live in groups called “pride”. The average pride consists of around fifteen lions, including several adult females, up to four males. But extremely large prides consisting of up over 30 individuals have been observed. Asiatic lion prides differ from African prides in group composition. Asiatic lions divide themselves into two prides. Male Asiatic lions are solitary or associate with up to three males forming a loose pride. Females associate with up to 12 females forming a stronger pride together with their cubs. Female and male lions usually associate only for a few days during the mating season. They rarely travel and feed together, too. Not all lions live in a pride. There is also another group with a different social behavior: nomads. Nomad lions range widely and move about sporadically, either singularly or in pairs. Pairs are more frequent among related males who have been excluded from their birth pride. 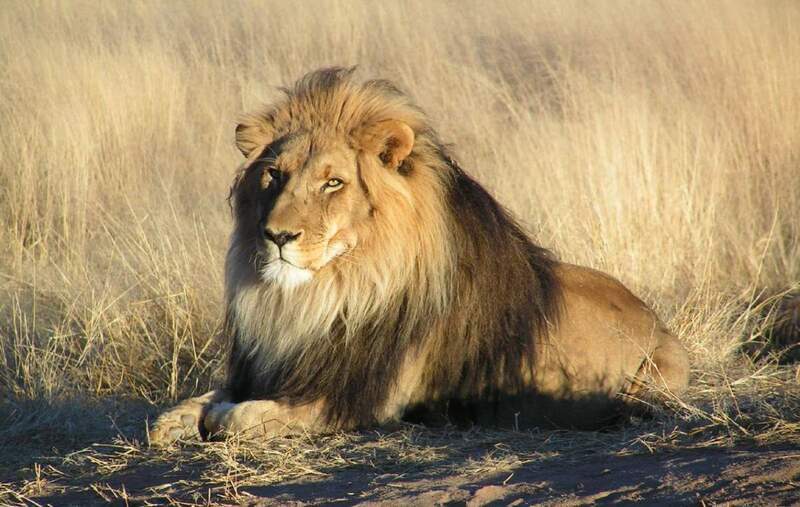 Lions sometimes switch lifestyles: nomads may become a pride member and vice versa. 7. They sleep a lot! Like all felids, lions sleep a lot. They sleep or rest around 16-20 hours a day. Male lions sleep more: they spend 18 to 20 hours a day snoozing, while females get 15 to 18 hours of sleep. Why do lions sleep so much? Because, like all cats, they have the physiology of a predator, and hunting prey takes an amazing amount of energy. All cats, including big cats, sleep a lot to reserve energy for running, pouncing, fighting and stalking. Lions, like all big cats, tend to be nocturnal, doing most of their hunting after dusk when it’s cooler, so most of their sleep is accumulated during the day. It’s also good for avoiding hot African sun. Male lions typically weigh between 150-250 kg (331-551 lb). The typical weight range for females is 120 to 182 kg (265 to 401 lb). Male African lions are 140 to 200 cm (4.5 to 6.5 feet) long from head to rump. Females range between 140 to 175 cm (4.5 feet to 5 ft 9 in) in body length. The biggest lion ever recorded and documented was around 375 Kg (827 Pounds) in weight (an African lion). This lion was witnessed in captivity at Ireland’s Dublin Zoo in 1959. It was believed to be at least 10 feet (3.05 meters) long and looked very huge. The biggest lion in the wild weighed around 690 pounds (313 kg), which is very exceptional for a lion; especially in the wild. It was shot in 1936 in South Africa’s Transvaal area. Asiatic lions tend to be smaller than their African cousins. Adult males typically weigh between 350 and 420 pounds (158-190 kg), while adult females weigh between 240 and 365 pounds (108-165 kg). Male lions tend to live shorter because they sometimes engage in deadly fights with rival males. Captive lions, both males and females can live more than 20 years. But exceptions might occur. Some lions, mostly males, seem to seek out human prey. 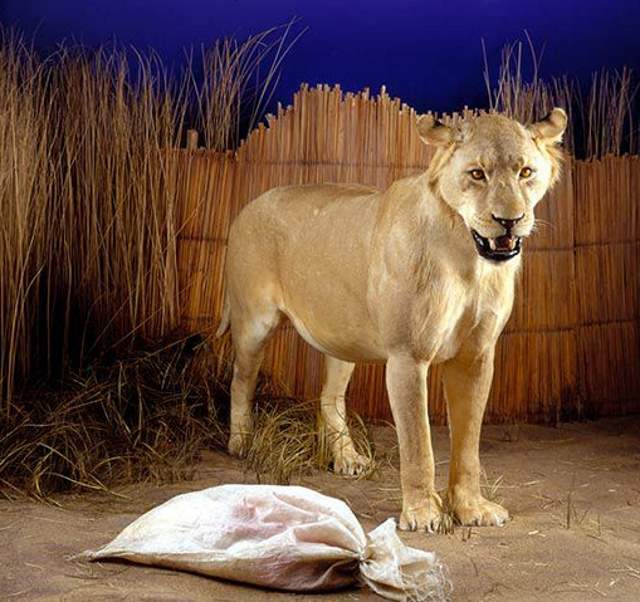 One well-documented example was Mfuwe man-eater, an enormous male lion that terrorized the small town of Mfuwe and the surrounds in the Luangwa River Valley of eastern Zambia. Another famous example was Tsavo maneaters. They were a pair of man-eating maneless male East African lions from the Tsavo region of Kenya, which responsible for the deaths of a number of construction workers on the Kenya-Uganda Railway from March through December 1898. The number of victims was probably 28 or 31. Man Eater Lion of Mfuwe, body on display at Chicago’s Field Museum. He was a huge lion, more than 3 meters (ten feet) from snout to tail. Like Tsavo Man-Eaters, he was totally maneless. Why there’s a white bag near him? Because, in 1991, after killing at least six people in a village, he strutted through the center of the village. He was reportedly carrying a white laundry bag that had belonged to one of his victims. Mfuwe man-eater was killed by a California man on safari. Like one of the Tsavo Man-Eaters, his health was not in perfect condition: he had fractured its right mandibular ramus. This may have been a decisive factor influencing its consumption of humans. Lions rely heavily on their teeth to grab prey, suffocating the animal or collapsing its trachea. Because of this constant use, about 40 percent of African lions have dental injuries, according to a 2003 study. The mane of the male lions usually considered a protective element during fights. In 1871, Charles Darwin suggested that the mane provides protection in intraspecific fights. But it also has an important role in sexual selection. If a male has a big, gorgeous and well-kept mane, this sends a signal to the females that this particular male is in a very good health condition thus can be a good candidate to mate. The rule of thumb is the darker and fuller the mane, the healthier the lion. In the Serengeti National Park, female lions favor males as mates with dense, dark manes. During agonistic confrontations with other lions, the mane also makes the lion appear larger. According to a 2005 study, although the mane may have conferred protection during the early evolution of the trait, the protection appears to be secondary to the strong sexually selected advantages of the mane as a condition-dependent ornament. Lions are not very fast animals, while some of their prey are really fast. For example, a wildebeest can achieve a top speed of 80 km/h. Lions are also not particularly known for their stamina – for instance, a lioness’ heart makes up only 0.57% of her body weight (a male lion’s heart is about 0.45% of his body weight), whereas a hyena’s heart is close to 1% of its body weight. Thus, they only run fast in short bursts and need to be close to their prey before starting the attack. They take advantage of factors that reduce visibility; many kills take place near some form of cover or at night. Surprisingly, lions do not take into account wind direction when hunting. This is probably one of the reasons of their relatively low hunting success rate. Some sources claim lions can run as fast as 80 km/h (50 mph). This figure was originally provided by Howell (1944), but this estimate is unrealistically high. Guggisberg (1961) and George Schaller (1976) revised this outlandish proposition to around 48 to 59 kph (30 to 37 mph) for the speed of lions. Schaller also pointed out that although the lion has the initial advantage of acceleration, once a zebra or other fast-moving prey animal is able to attain their full speed, a lion is rarely able to catch it. Sometimes even when the prey animals were not running at full speed, the pursuing lion was still unable to keep up. But they are rare. Because they can be born only if both parents possess a recessive mutation in a gene that makes colored pigments called melanins. 17 births have been recorded in five different prides between 2007 and 2015. 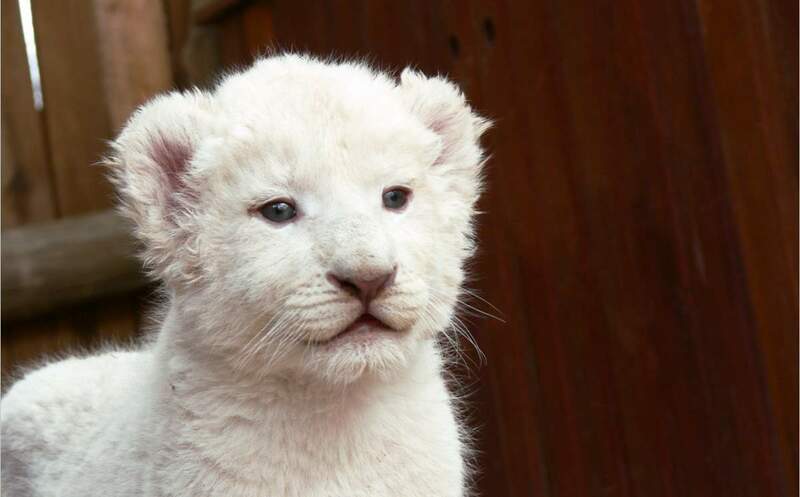 On March 5, 2018, a white lion cub has been seen at the Ngala Private Game Reserve in South Africa. Technically, these animals are considered leucistic, not albino, because they have some pigment in certain areas, such as the eyes. White lions are also exceptionally rare to see fully grown in the wild; most of the white lion cubs don’t reach adulthood. A lion’s usual tawny color helps it blend into tall grasses and other vegetation. The animals also hunt at night, when a white lion would stand out even more. Meaning that they can go into heat several times per year. They give birth to 2-3 cubs at a time. Like house cats, lion cubs themselves are born blind and their eyes do not open until roughly a week after birth. Usually, the mother does not integrate herself and her cubs back into the pride until the cubs are six to eight weeks old. Sometimes this introduction to pride life occurs earlier, however, particularly if other lionesses have given birth at about the same time. If this occurs, once the cubs are past the initial stage of isolation with their mother, the cubs are then raised together, sometimes nursing communally, the cubs suckle indiscriminately from any or all of the nursing females in the pride. Lions usually hunt in groups. Young individuals begin to hunt effectively when nearing the age of two. A single lion is capable of bringing down prey like zebra and wildebeest, which can be twice their own weight. Larger prey like a giraffe needs teamwork. In prides, lionesses do most of the hunting. Prey is typically eaten at the location of the hunt, although large prey is sometimes dragged into cover. Lions can kill animals much larger than themselves. After a successful hunt, all the lions in the pride share the meal. But there is a pecking order, with the adult males taking the first claim, followed by the lionesses, and finally, the cubs. When food is scarce, cubs tend to suffer the most but otherwise, all pride members can eat their fill, including old and crippled ones which can live on leftovers. In the amazing video below, published by the National Geographic channel, a lioness with an injured jaw gets help in eating a carcass from the other lionesses of the pride. An adult lioness needs to consume an average of about 5 kg (11 lb) of meat per day. Males are larger, and naturally, they need to eat more, about 7 kg (15 lb) per day. A lion may gorge itself and eat up to 30 kg (66 lb) in one sitting. A male lion’s roar can be heard from a distance of 8 kilometers (5 miles). The roar is usually used to advertise the animal’s presence. Lions do not purr. The largest cats that can purr are cougars (also called pumas, mountain lions, catamounts, Florida panthers, painters, ghost cats, etc). That’s why cougars are considered part of the lesser/small cat classification when it comes to their ability to purr and not roar. Baby lion cubs trying to roar like there father ROAAAAR, so cute! They do not love water, but, despite that, they are still great swimmers. Lions can sometimes even hunt or chase their pray in the water, as seen in the BBC video below. Lions of the Kalahari desert face water obstacles as they hunt Buffalo in this brilliant BBC wildlife footage from both land and air. Lions have a hairy tuft at the end of their tails. 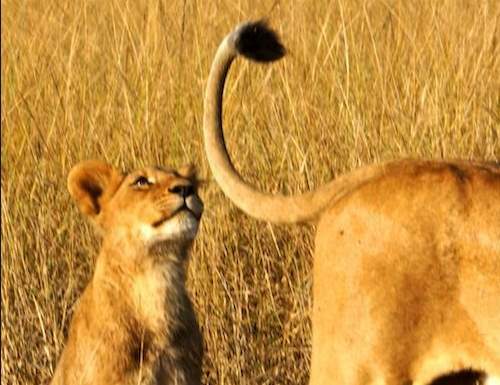 Besides looking really cool and offering the perfect fly swatter, these tails allow lions to relay simple messages to each other when on the hunt. Lions have a hairy tuft at the end of their tails. Bonus fact: Mountain lions (pumas, or cougars) are not lions. The term “Mountain lion” was first used in writing in 1858 from the diary of George Andrew Jackson of Colorado, a gold digger. A Missourian by birth, he worked in the California goldfields from 1853 to 1857. He headed to Colorado when gold was discovered here in 1858. 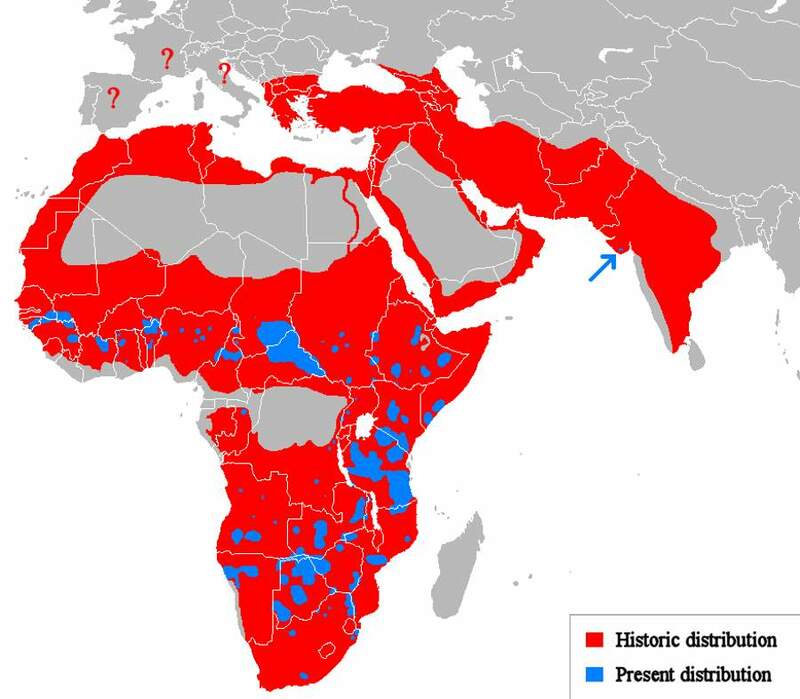 Lion has been listed as Vulnerable on the IUCN Red List since 1996, as populations in African range countries declined by about 43% since the early 1990s. Like most wild animals which share the same status, habitat loss and conflicts with humans are considered the most significant threats to the lion populations. They are mostly killed by humans in bravery rituals, as hunting trophies, for (non-existing!) medicinal powers, or by ranchers protecting their livestock. Estimates of the African lion population range between 16,500 and 47,000 living in the wild in between 2002–2004, down from the early 1990s estimates that ranged as high as 100,000 and perhaps 400,000 in 1950. Panthera is a genus within the Felidae family that was named and first described by the German naturalist, botanist, biologist, and ornithologist Lorenz Oken (1 August 1779 – 11 August 1851) in 1816. The British zoologist and taxonomist Reginald Innes Pocock F.R.S. (4 March 1863 – 9 August 1947) revised the classification of this genus in 1916 as comprising the species lion, tiger, jaguar, and leopard on the basis of cranial features (for example, only these for have the anatomical structure that enables them to roar). Later, results of genetic analysis indicate that the snow leopard also belongs to the Panthera genus, a classification that was accepted by IUCN assessors in 2008.